Maurice "Rocket" Richard in action on Dec. 14, 1954. Maurice "The Rocket" Richard was not only on top of his game back on Oct. 19, 1957 -- the night he became the first NHL player to score 500 goals -- he was atop the entire hockey world. Richard came on to the ice at the Montreal Forum with 499 goals, needing just a single score against the Chicago Black Hawks’ Glenn Hall to become the first NHL player to reach 500 goals. At the time, “The Rocket” was the game's most feared player and scorer, the winner of six Stanley Cups to that point, the 1947 Hart Trophy winner and five-time runner-up for the Art Ross Trophy. On the night Richard scored his 500th goal, the Canadiens dominated the NHL landscape. In the previous decade, they had matched efforts with a pair of dynastic teams, the Toronto Maple Leafs, who won four Stanley Cups in five years and six in seven years from 1945-51, and the Detroit Red Wings that won four Stanley Cups in six years from 1950-1955. The Canadiens were in the midst of their own dynasty. They had won the second of their unequaled five straight Stanley Cups the previous spring. The Canadiens dispatched the Red Wings in five games in 1956 and the Boston Bruins in 1957. By then, Toronto had faded out of playoff contention. The Canadiens stood tall astride the hockey world and Richard was their leader the night that the Black Hawks, the last-place team the previous season, invaded the Forum. Near the 15-minute mark of the first period, Chicago defenseman Ian Cushenan was called for holding Richard. Canadiens coach Toe Blake sent out Jean Beliveau to center Dickie Moore on the left wing and Richard on right wing, his off-wing, which he preferred. Defenseman Doug Harvey was on the left point and Bernie “Boom Boom” Geoffrion on the right. Yes, the venerable Forum was full of future Hockey Hall of Famers that night, including Red Fisher, the great hockey writer of the Montreal Gazette. "Cushenan was off for holding The Rocket and the Canadiens sent out what was probably the greatest power-play unit of all time," Fisher recalled. "Moore was on the left wing, replacing (Bert) Olmstead, who normally skated left wing on the line with Beliveau and Richard. Moore brought the puck into the Chicago zone and made a sharp pass to Beliveau, who was to Hall's left on the other side of the ice. Beliveau passed to The Rocket who was about 15 to 20 feet away in the slot for a one-timer. ”Rocket didn't go for the slap shot very much. He just one-timed it hard past Hall. Richard had two or three earlier opportunities and Hall made big saves, but he couldn't stop him on the 500th goal." Fisher commiserated with Moore and Beliveau, the two surviving members of that power-play unit who were on the ice with Richard. Neither remembers the specifics of that significant goal, one of dozens, perhaps hundreds, in their careers. "Did (Bobby) Rousseau get the assist on that?" asked Beliveau, still sharp at 76. No, you did, he was reminded. "Oh man, we got to a point in our careers where we were reaching milestones all the time, the Rocket, Henri, me, Dickie Moore, Boom Boom," Beliveau said. "And we scored so many goals in our careers, I can't remember them all, even some of my own milestones. I'm being asked about this one and I can't separate it from others. I remember his 400th goal was a big deal, too. The Stanley Cup goals, the big ones that won championships, they're easier to remember." "Red Fisher called me the other day and I told him the same thing. I don't really remember the specifics of that goal," Moore said. "Red said the fans gave Rocket a two-minute ovation. The Rocket got a lot of long ovations in the Forum." "Back then, it was just a regular-season game,” Hall of Fame defenseman Tom Johnson said. “I'm sure Rocket fished the puck out of the net because it sold for a good price when he auctioned off his memorabilia. But normally, the ref would just get the puck and go right to center ice for the faceoff. Sure, the Forum was sold out for that game. It was always sold out." That sell-out crowd poured out onto St. Catherine's Street knowing all was well with their world. The reigning champion Canadiens won, 3-1, the power-play was clicking and The Rocket was at the top of his game. He had 33 goals the previous season, 38 in each of the two years prior to that and 37 the year before that. There was no way they could know that night that Richard would suffer a serious injury less than a month later and be limited to 28 regular-season games that season. Another injury in 1958-59 would limit him to 42 regular-season games. Richard rebounded very well from his injury in November 1957 and returned for an outstanding performance in the Stanley Cup Playoffs. If the Conn Smythe Trophy, which goes to the most valuable player in the postseason, existed then, Richard would have won it with his 11 goals and four assists in 10 games. He was scoreless in four playoff games the next year. 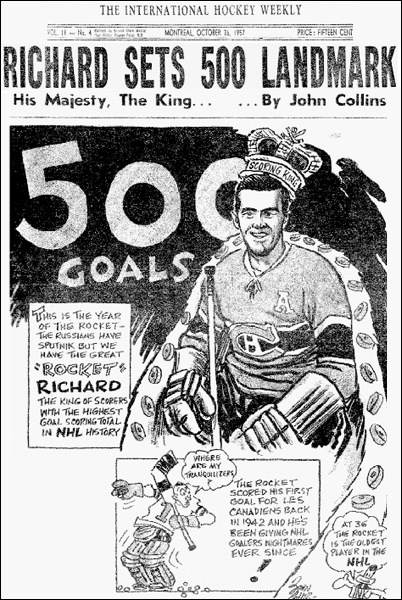 Richard announced he would retire after the 1959-60 season and kept his word after posting 19 goals and 16 assists. He had a goal and three assists in the two sweeps in the 1960 playoffs. Richard completed 18 NHL seasons with 544 goals and 421 assists for 965 points in 978 regular-season games, and 82 goals and 44 assists for 126 points in 133 playoff games. It's a rare player who can score at the same rate in the playoffs as the regular season and The Rocket, by all accounts, was the ne plus ultra of hockey players, none better. “The Rocket's” first two seasons (1942-43 and 1943-44) had been limited by serious injuries, and Canadiens' management worried that he was becoming too fragile for the NHL. Still, Richard returned in 1944-45 to flourish on a line with Elmer Lach and Blake, who would become his coach in the 1950s. Richard had helped lead the Canadiens to the Stanley Cup in 1944, 1946, 1953 and 1956. 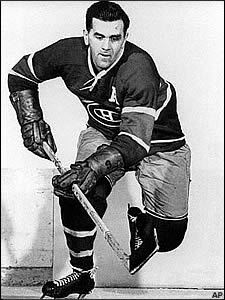 In the 1950s, he skated and scored on lines with great Canadiens teammates like Beliveau, Moore, Olmstead, Geoffrion and his brother, Henri. Montreal’s power play, consisting mostly of those players and defenseman Harvey, was so overpowering that the NHL changed the rule to allow the penalized player to return to play after a power-play goal was scored. Before that, the Canadiens often scored multiple goals during two-minute penalties.